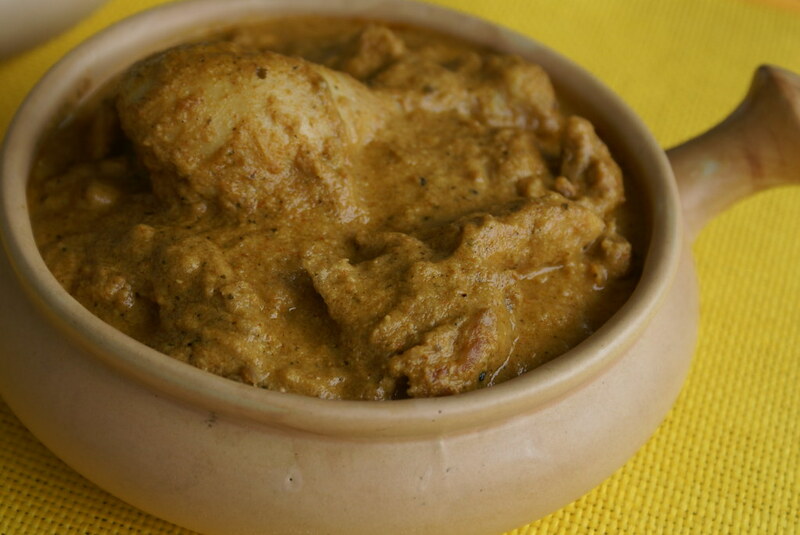 This is the chicken recipe a bit different from the regular chicken curry I make. This was shared by my friend J and everyone at home loved the taste and flavor very much. It is definitely worth a try! Marinate chicken pieces in chilli powder, turmeric powder, curds and salt for 30 min. While the chicken pieces are marinating, make a paste of cashewnuts, watermelon seeds and chironji and milk. Keep aside. (If you dont have watermelon seeds and chironji, use around 10 cashewnuts). Dry roast cinnamon, cloves and curry leaves for 1 min and make a powder of them. Keep aside. Heat 1 1/2 tbsps of oil in a kadai. Add the onions and saute till pink. Add ginger-garlic paste and saute further for another 3-4 minutes on medium heat. Add coriander pwd, cumin pwd, pepper pwd and mix well and fry for another minute. Add the tomatoes and let it cook for 3-4 minutes. Combine well and cook till oil separates.Turn off heat. Cool and grind the cooked masala. Keep aside. Heat 1 1/2 tbsps oil in an other wide kadai and add the marinated chicken and cook on high flame for 4-5 minutes, reduce heat and cook covered for another 4-5 minutes. Add the ground masala paste, cashewnut paste and ground powder of cinnamon,cloves and curry leaves and combine well. 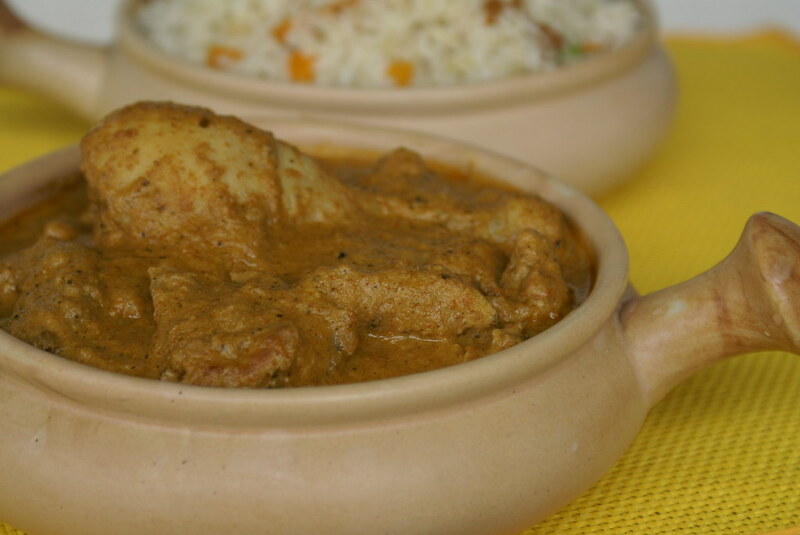 Cook till chicken pieces are soft and you get the desired curry consistency. Adjust salt.Garnish with fresh coriander leaves. Goes well with rotis or Jeera Rice/Bagara Rice. The curry leaves add the twist to the curry. It is a hit with the family and I would definitely try it again. I am utterly delighted that my blog is being showered with awards…… I am thankful to everyone out there, who thinks that my blog is worth them 🙂 Thank You all!!! Usha of Veg Inspirations and LubnaKarim of KitchenFlavours passed me on “The Brilliant Web Blog Award“…. Thank You Girls. Vaidehi of Chakili passed on the “Friendship Award” …. Thank You Vaidehi. Padma of Padma’s Kitchen passed me on the “Arte Y Pico” award. Its really nice of her to think that content of my blog is creative, interesting, and it inspires the blogging community. Thank You all for your sweet gestures… I am honored!! the curry looks wonderful, love the dish youa re serving it in too. This looks different and tasty! I will have to look for a couple of ingred’s so I can make this, sounds really good! Cinnamon, the curry looks lip smackingly good! I thought it would be green when I saw the name! It looks good. I use a lot of curry leaves because I love the smell of them in curry. looking gud!!!! congrates on your flow of awards..
Hmm looks gr8. I took make this as a side dish for roti’s. But never added curry leaves. Iam gonna try this out soon. first time to ur site! u have a very nice cooking blog here! visit my blog while u find time! join in the chicken event going in my blog! add us as a follower of my blog to have my recipes in ur dashboard itself!